Doctor Dolittle is a charming fantasy excursion which creates a wonderful world of endless imagination through music, dance and special effects. Rex Harrison stars in the madcap adventures of a 19th Century English doctor. The doctor walks and talks and squawks with the animals. Based on the charming stories of Hugh Lofting, the good doctor gets himself into all sorts of funny predicaments in this fun family film. It earned an Academy Award nomination for Best Picture. With terrific music, fine acting, lovable creatures and a joyous fantasy tale, Doctor Dolittle is a classic for young and old alike. 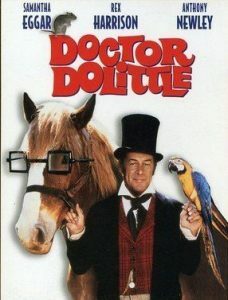 ﻿ In short, Doctor Dolittle is one of the children’s movies that I loved as a child, and still love as an adult. Let me contrast that with Chitty Chitty Bang Bang. As a child, I loved both movies. As an adult, I can still enjoy the various musical numbers in both. But, I can sit and watch the Doctor Dolittle movie from start to finish as an adult and still enjoy it. It’s a wonderful fantasy, colorful and dynamic. Some of the scenes — specifically at the circus — are just as great a spectacle as when I was a child. Add to that the sets and costumes look real, good acting, and characters that the audience cares about, and you have a wonderful movie. Doctor John Dolittle (Rex Harrison, The Yellow Rolls-Royce). The doctor who’s not very good with people – but learns to talk to animals with help from his multilingual parrot. And goes around the world to help animals in need. His current quest is to find the Great Pink Sea Snail. Matthew Mugg (Anthony Newley, Charlie and the Chocolate Factory). One of Dr. Dolittle’s few human friends, who accompanies him on his adventure. He also brings along Stubbins, and drops a “hint” that helps “Fred” stow away on board their ship. A nice, friendly Irish man – as he’s not shy about telling you! Tommy Stubbins (William Dix, The Nanny). The young boy, Matthew’s friend, who also comes along. A reflecting board for the young audience members. Also a very nice young man. Emma Fairfax (Samantha Eggar, The Molly Maguires). The niece of General Bellowes, who’s first offended by Dr. Dolittle. Then, she likes him. Then, stows away on his boat. And begins to fall in love with the older man. She’s given the nickname “Fred” by Matthew. It’s not an insult, it’s a pet name after she does the “if I were a man” routine. Albert Blossom (Richard Attenborough, Jurassic Park). The circus owner, who displays Dr. Dolittle’s Pushme-Pullyou — making a small fortune for them both. One of the outstanding musical numbers, I’ve Never Seen Anything Like It, features him extensively. William Shakespeare X (Geoffrey Holder, Live and Let Die). The law reader on the island that the gang finally arrives at; an understated, hilarious performance. Get ready for the wildest adventure of a lifetime in the most ambitious musical production ever brought to film. Earning a 1967 Academy Award nomination for Best Picture, this dazzling fantasy turns both ordinary and exotic animals into talking, dancing and singing sensations! Rex Harrison is unforgettable in this inspiring adaptation of Hugh Lofting’s classic stories. Step into the English country home of the good doctor as he performs remarkable treatments on the wildest variety of patients you could imagine. Discover his secret cures and watch with wide-eyed excitement as he and his four-legged, fine-feathered friends charm their way into your heart!